A retinol serum is a great way to Optimize your skin as part of a COMP skincare routine. While retinol/vitamin A is far from the only great anti-aging ingredient out there (others include hyaluronic acid, vitamin C and E etc. ), it plays a rather fundamental part in a good anti-aging skincare routine. Below we have made a list of five of the best retinol serums with low or moderate concentrations of vitamin A. As described in our list of best retinol moisturizers, we recommend that you start out by using retinol products with a low concentration (≤0.1%), preferably lower than 0.05% to build your skin’s tolerance to this potent ingredient. Hereby you can increasingly benefit from the advantages of retinol, rather than starting off too strong and quitting it altogether because of irritation. Start out by using the retinol product every other evening or less and then increase use to every evening. You can then gradually work your way up through moderate strengths of retinol (0.1%-0.5%), but be aware that strong retinol products (0.5%-1%) are not necessarily for everyone. Your skin might only tolerate low or moderate concentrations, but as long as you are diligent and persistent in your use of retinol and sunscreen in the daytime you will still get great results without struggling through more concentrated products. In some countries you can also find over-the-counter products with much higher concentrations than 1%, but in general a 1% concentration is considered to be the best compromise between benefit and side effects. Besides irritation, other side effects are flaking skin and redness. Many cosmetic manufacturers do not disclose the actual concentration of retinol in their products – allegedly because they want to avoid a race among manufacturers to produce more and more concentrated product. This tendency does not leave you as high and dry as you might fear. First of all, you can be pretty sure that a retinol product with an undisclosed retinol amount “only” has a low – or more rarely moderate concentration of retinol. This is exactly due to the issue of side effects; a higher concentration is bound to create more side-effects and thus potentially unhappy customers – unless they are informed about the concentration level in advance and therefore know what they are getting into. A low price is also an indicator of a lower concentration; retinol is an unstable ingredient and it is simply expensive to stabilize it in higher concentrations. For an efficient 1% retinol product you should expect to pay at least 50 dollars for 1 ounce of product. There are of course also more expensive products with lower concentrations. In some cases you can also estimate the actual concentration from looking at retinol’s place on the ingredient list if it is placed after regulated ingredients such as parabens etc. Those who cannot commit to using sunscreen every day all-year-round. If you are continuously reacting to a mild fragrance-free retinol product no matter if you only use it a few nights per week or even dilute it with your usual moisturizer, chances are that retinol is simply not for you. Vichy’s LiftActiv Retinol HA Advanced Concentrate does, in spite of the name, only contain a low concentration of retinol which makes it suitable for beginners in the retinol game. Besides retinol and some hyaluronic acid (in the form of sodium hyaluronate), the Vichy serum also has a good amount of LR2412 which is a derivative of jasmonic acid. This ingredient has shown some good potential for correcting the signs of skin aging, as described in a recent article brought in the Journal of European Academy of Dermatology and Venerology (2014). Vichy LiftActiv Retinol HA is also available in a “night/nuit” version, which is richer and contains more hyaluronic acid, but less retinol. Neither serum should, however, be used in the daytime without sun cream as they don’t contain any sun protection (SPF). Vichy LiftActiv Retinol HA Concentrate Retinol Serum, 1.01 Fl. Oz. While SkinMedica might have some mixed press about their TNS-products (based on skin cells from foreskin! ), their retinol serums or complexes are close to flawless. Unlike many other retinol products, SkinMedica Retinol Complex does not only include retinol in its formula, but also a long line of antioxidants and skin-repairing ingredients. These include niacinamide, squalane, squalene, tocopherol, bisabolol, Dunaliella Salina (green micro-algae) extract, Oryza Sativa Bran Cera (wax of rice bran) and more. Thereby, you are getting more than just a simple retinol treatment when using this serum. The SkinMedica Retinol Complex is available with three different concentrations of retinol; 0.25%, 0.5% and 1%, so these retinol serums are meant for people who have already tried less concentrated retinol products and are ready for the next step. SkinMedica Retinol 0.25 Complex, 1 oz. In our list of the best retinol moisturizers we mentioned the Skin Balancing Retinol serum for oily skin from Paula’s Choice, as oily skin often won’t need much more moisture than a serum. However, if you have drier skin we would recommend the Skin Recovery Super Antioxidant Concentrate Serum instead. It has a little less retinol (0.01%) than the serum for oily skin, but also different beneficial and moisturizing ingredients like evening primrose oil, olive oil and several curcumine-derived antioxidants. The Skin Recovery Super Antioxidant Concentrate Serum has an intense orange color; don’t be alarmed – it is supposed to look like that. 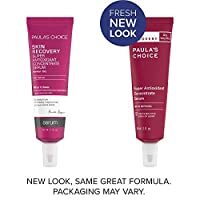 Ingredients – Paula’s Choice kin Recovery Super Antioxidant Concentrate Serum: Cyclopentasiloxane (silicone slip agents) • Dimethicone (silicone slip agents) • C12-15 Alkyl Benzoate (thickener) • Olea Europaea (Olive) Fruit Oil (plant oil/antioxidant) • Tocopherol (vitamin E/antioxidant) • Retinol (antioxidant/cell-communicating ingredient) • Tetrahexyldecyl Ascorbate (vitamin C/antioxidant) • Bisabolol (anti-irritant) • Haematococcus Pluvialis Extract (antioxidants) • Tocotrienols (antioxidants) • Adenosine (cell-communicating ingredient) • Tetrahydrodiferuloylmethane (curcumin-derived antioxidants) • Tetrahydrodemethoxydiferuloylmethane (curcumin-derived antioxidants) • Tetrahydrobisdemethoxydiferuloylmethane (curcumin-derived antioxidants) • Camellia Oleifera (Green Tea) Leaf Extract (antioxidants/anti-irritants) • Vitis Vinifera (Grape) Seed Oil (antioxidants/anti-irritants) • Chamomilla Recutita (Matricaria) Flower Extract (anti-irritant) • Arctostaphylos Uva Ursi Leaf Extract (non-volatile plant extract) • Stearyl Dimethicone (silicone skin-conditioning agent) • Glycine Soja (Soybean) Oil (plant oils/antioxidants) • Vitis Vinifera (Grape) Seed Extract (antioxidants/anti-irritants) • Oenothera Biennis (Evening Primrose) Oil plant oils/antioxidants) • Vaccinium Macrocarpon (Cranberry) Seed Oil plant oils/antioxidants) • Rubus Idaeus (Raspberry) Seed Oil plant oils/antioxidants) • Vaccinium Myrtillus (Bilberry) Seed Oil plant oils/antioxidants) • Elaeis Guineenis (Palm) Oil plant oils/antioxidants) • SD Alcohol 40 (solvent). First, all brand confusion should be eliminated: Replenix is a skin care line under Topix Pharmaceuticals (which has several other lines/brands such as Glycolix, Citrix etc. ), which focuses on products with green tea polyphenols. 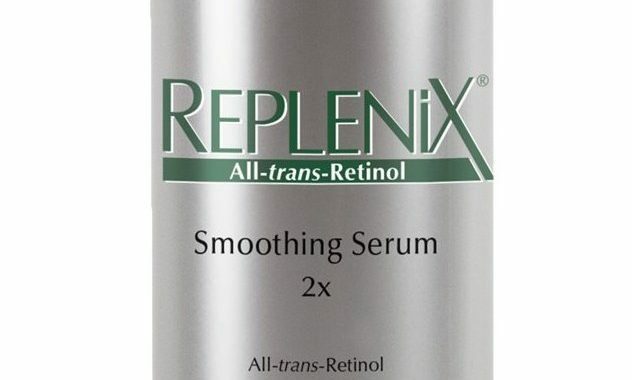 However, Replenix is probably best known for its Smoothing Serum with retinol which is available in four concentrations from 0.2% and up to 1% retinol. Replenix suggests its Smoothing Serum 2x (=0.2% retinol) for sensitive skin, the 3x (=0.3%) for normal skin, 5x (=0.5%) for tolerant skin and 10x (=1%) for advanced treatment, but if you are completely new to retinol we would recommend that you start with less concentrated products, e.g. less than 0.05% of retinol to build up tolerance slowly. Besides green tea phenols and retinol, the fragrance-free Replenix Smoothing Serum also contains skin-repairing hyaluronic acid. Ingredients – Replenix Smoothing Serum 2x: Cyclopentasiloxane • Dimethicone Crosspolymer • Cyclomethicone • PEG/PRG 18/18 Dimethicone • Caffeine • Camellia Sinensis (Green Tea) Polyphenols • Retinol • Polysorbate-20 • Purified Water • Hyaluronic Acid. The border between serums and lotions/creams is rather undefined, which the consistency and name of CeraVe Skin Renewing Cream Serum is an example of. People who does not have particularly dry skin will probably find this serum rich enough to also cover the Moisturize step of a COMP routine. CeraVe Skin Renewing Cream Serum is the cheapest serum in this review, but nonetheless contains some good antioxidants and skin-repairing ingredients besides retinol. It claims to have a 1% complex of retinol and ceramides, but emphasis is probably on the latter as the price is simply too low for the serum to contain that much retinol (it is expensive to stabilize retinol in higher concentrations). CeraVe Skin Renewing Cream Serum is a great affordable serum with a low to moderate concentration of retinol, but if you are looking for something more potent you will have to spend more. Posted in Skincare Reviews and tagged anti-aging, anti-wrinkle, CeraVe, Paula's Choice, Replenix, retinol, serum, SkinMedica, Vichy.